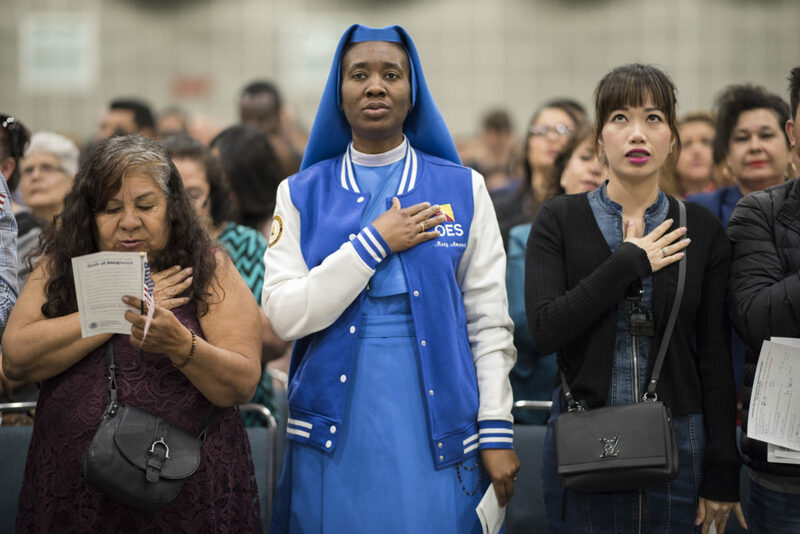 The newest U.S. citizens raise their right hands and take an oath during a naturalization ceremony last week at the Los Angeles Convention Center. Over 32 percent were from Mexico. Maria Manzo cleaned houses, baby-sat and spent countless Sundays selling burritos at a swap meet to support her eight children, who emigrated with her from Mexico more than 30 years ago. When a son eventually became a legal resident, Manzo, now 82, was able to apply for a green card, ensuring that she, too, could remain a permanent resident of the United States. For decades, that was enough. Manzo had no sense of urgency about taking the next step: applying for U.S. citizenship. She had little extra money to spend on English and civics classes, which she needed to gear up for the test required to become a citizen. Her green card made her feel secure, allowing her to travel, if she wished, to see relatives in Mexico and return without hassles to her home in Garden Grove, California. But after Donald Trump was elected president in 2016, Manzo, like many permanent residents across the U.S., began to feel differently. 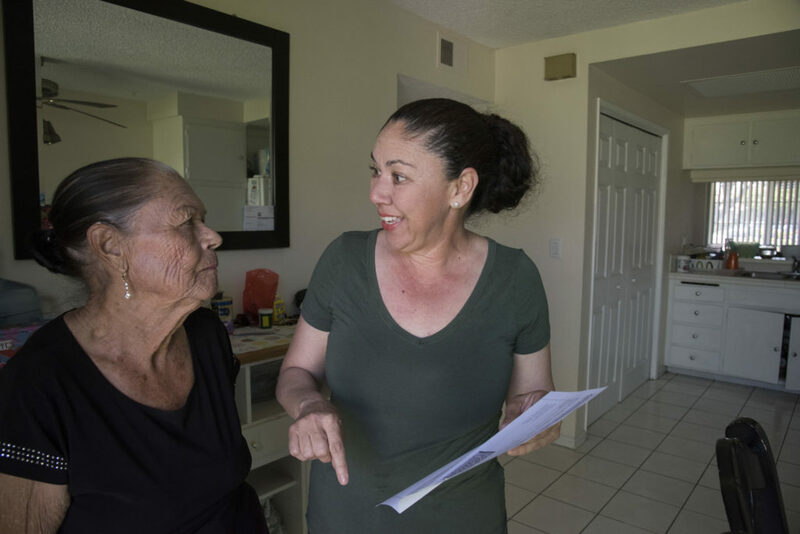 Now the great-grandmother is among hundreds of thousands of permanent U.S. residents applying annually for citizenship, clogging an already-burdened system that relies mostly on fees from applicants such as Manzo to keep itself afloat. In the year after the election, the backlog at U.S. 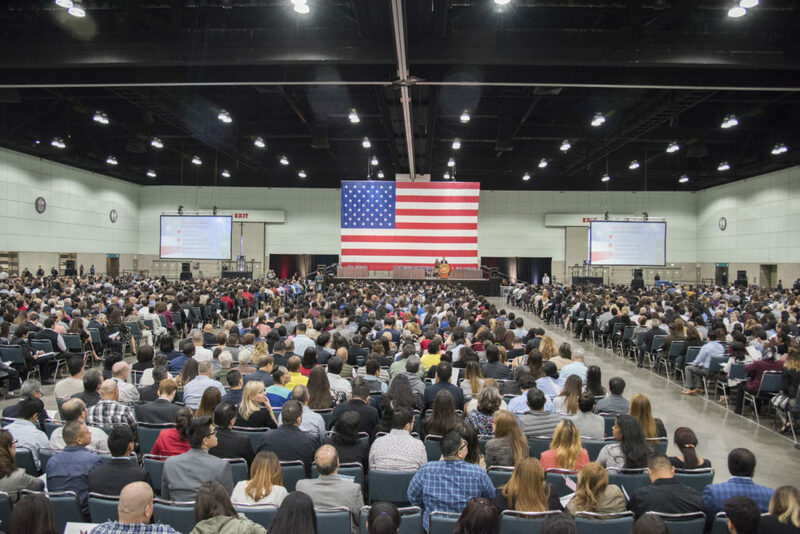 Citizenship and Immigration Services grew 40 percent, to nearly 735,000 pending applications – with pronounced surges in several states with the highest immigrant populations: California, Florida, Illinois, New York and Texas. As a result, the wait time has grown, too. The backlog creates “a second wall,” said Emily Gelbaum, chief of staff for the National Partnership for New Americans, in addition to the one Trump has vowed to build at the U.S.-Mexico border. 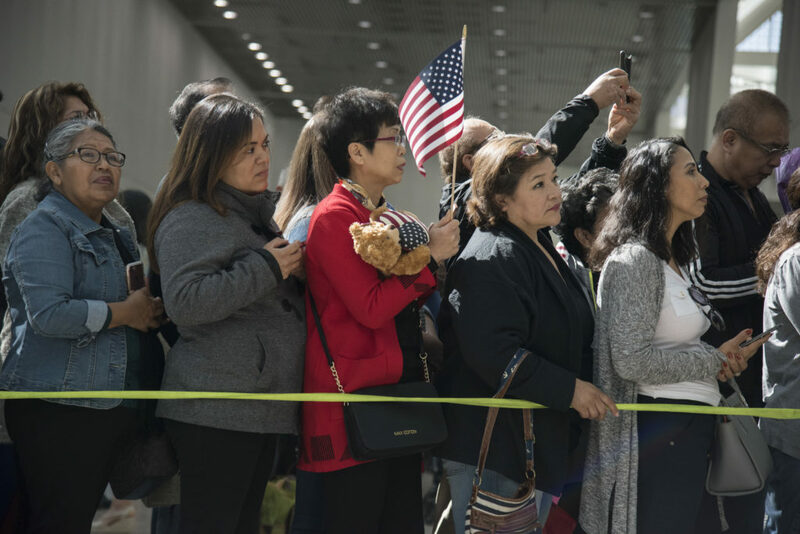 Immigrant advocates say that aside from ensuring their personal security, citizenship applicants want the right to vote – in many instances against the current administration and its backers. Gelbaum, whose organization is a consortium of nonprofits that advocate for immigrants, told Reveal from The Center for Investigative Reporting that she is concerned that the slowdown is deliberate, a move to “suppress the vote” of these potential citizens. Manzo, with her daughter Griselda, recently visited Catholic Charities of Orange County, seeking information about becoming a citizen. Maria Manzo was disappointed to learn that it could take up to a year, possibly longer, before her application would be approved. 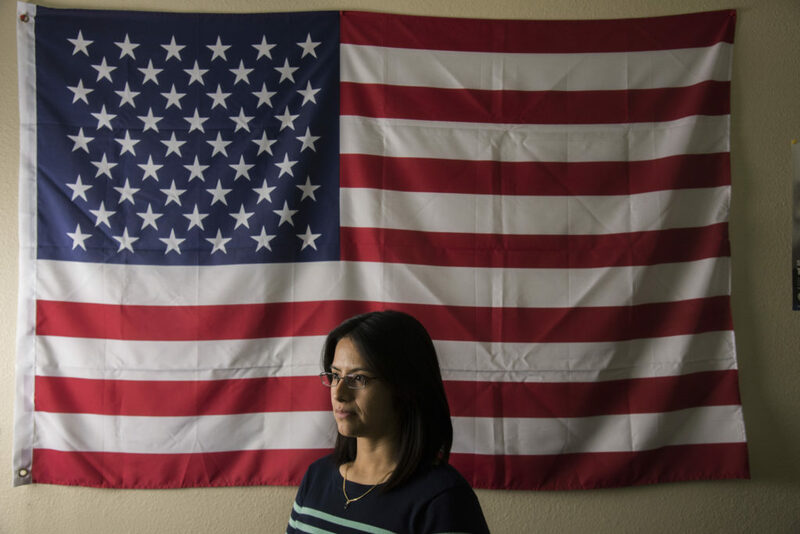 Still, she’s determined to take this final step toward protecting herself from deportation – and winning the right to vote. Green cards have to be renewed every 10 years and can be revoked. Official reasons are fraud in the application process; criminal activity, even low-level crimes; or staying out of the United States for more than six months. Today, those who work closely with immigrants say they hear the same fears over and over: that green cards are not secure, that the government could change the reasons for revoking a green card, that the rules could be unevenly applied in the current political climate. Scenes of chaos in airports during the Trump administration’s first attempt to impose a travel ban against several Muslim-majority countries in early 2017 unnerved many green card holders. Could their countries be targeted next? Jenny Rodriguez, who works on naturalization applications for Catholic Charities of Orange County, is helping Maria Manzo complete her paperwork. She said the anxiety and pressure applicants are feeling is palpable. She said the agency “recognizes the many contributions that have been made by immigrants throughout our history, and we take pride in providing the right immigration benefit to those who are eligible. Not everyone who’s decided to apply for citizenship feels a sense of urgency. Rosa Ramírez, 40, had been a green card holder for about seven years before she applied in April 2017. Her husband has had a green card as long as she, and although Ramírez says he’ll probably apply at some point, he hasn’t done so yet. “I simply wanted to take the opportunity and the advantage of being a part of this country,” Ramírez said after her March 15 naturalization ceremony at Oakland, California’s historic art deco Paramount Theatre. Following the ceremony, Ramírez had her first taste of those advantages. She applied for a U.S. passport and registered to vote at tables set up in the theater lobby. “I want to make sure to vote for those who don’t have a chance to do so,” she said. Waiting nearly a year for that right did not bother her. The process, she said, had seemed fair. However, the Trump administration already has taken several steps that will slow the process further for some applicants and keep others out of the pipeline altogether. It has tightened requirements for military members who previously had been promised an accelerated route to citizenship, delaying a process for at least 10 months that previously could take as little as 10 weeks. The administration also closed immigration offices on several military bases. Officials have increased scrutiny of applications for unaccompanied minors to remain in the U.S. and slowed down the process for them to get green cards, which delays their eligibility for citizenship. And the State Department has proposed adding a review of visa applicants’ social media accounts over the past five years, which also may slow the process. In late March, the administration also announced plans to use the 2020 census questionnaire to find out who in the U.S. is a citizen – and who is not, despite protests from the Census Bureau’s own experts. Administration officials argue that the question will help enforce the Voting Rights Act – aimed at increasing voter participation, not depressing it. Former Attorney General Eric Holder, who served in the Obama administration, is challenging the plan, as are attorneys general – so far all Democrats – in at least 17 states, including California and New York. Opponents say the move is directly aimed at intimidating immigrants and could result in an undercount because some people may avoid the census, which counts citizens and noncitizens to determine federal aid to states and localities and the boundaries of congressional districts. The recent spike in citizenship applications is out of the ordinary, according to León Rodríguez, who led U.S. Citizenship and Immigration Services for three years the during the Obama administration. Applications for citizenship increased gradually in recent years. In fiscal year 2014, the immigration agency received nearly 774,000 applications; a year later, nearly 783,000 people had applied. In the fiscal year that began Oct. 1, 2015, the number of citizenship applications spiked by nearly a quarter, to about 971,000. The following year, as the presidential campaign heated up, 986,000 applied. Nonprofit organizations that help immigrants apply for naturalization, such as Catholic Charities, also are seeing more requests for information about citizenship and help with the application process. Gregory Olson, who directs the New American Legal Clinic at the San Joaquin College of Law in California’s Central Valley, said he and his colleagues “are processing more applications than we ever have before.” The number has more than tripled in the past few years, he said, from about 35 applications per quarter in 2013 to 110 per quarter now. Law students help with the applications, and Olson is hoping to add more paralegal help. “The work has grown astronomically,” he said. 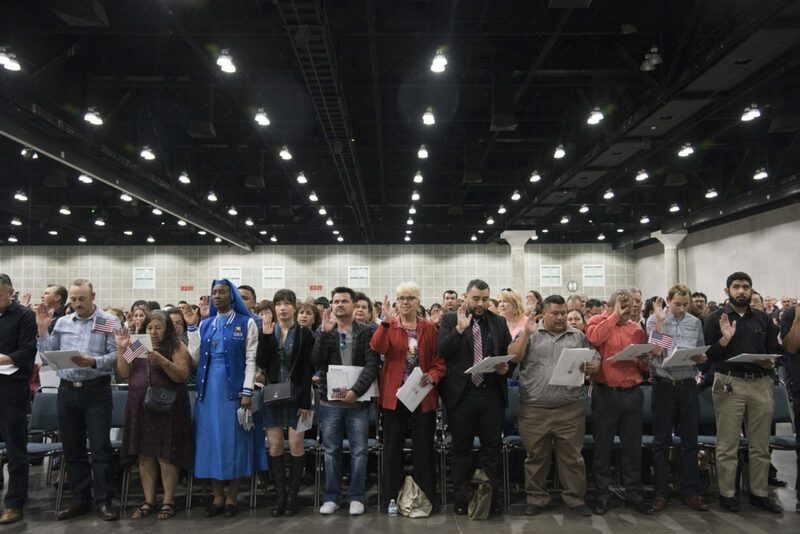 Since 2013, federal data shows that the time it takes for a naturalization application to wend its way through the approval process has more than doubled, from about four or five months to a year or more, depending on where the applicant lives. In Harlingen, Texas, for instance, the wait time is now as long as 18 months, according to recently released data from U.S. Citizenship and Immigration Services. In Fort Myers, Florida, the wait is even longer, up to nearly 21 months. That means that someone who applies now to become a citizen has almost no chance of getting sworn in before the November midterm elections. The immigration agency recently began publicly acknowledging the surge in applications and in mid-March changed its online listing to more accurately reflect wait times, agency officials said. Cabrera, the agency spokeswoman, said by email that the agency is reviewing its procedures and looking to new technology to “more efficiently” handle cases. The crunch at the immigration agency is not caused simply by a surge in applications. Internal challenges such as long-festering technology issues, which date back to its 2005 move to online applications, and limits on spending caused by its fee-based funding system have hampered the agency for several years, as detailed in several inspector general’s reports and a report by the Government Accountability Office. The fee-based funding was formally approved by Congress in 2002, when it separated immigration law enforcement functions from the segment of the agency that handles naturalization and green card processing. It is set up in such a way that makes it almost impossible for the agency to catch up. The agency’s funding is primarily drawn from the $725 citizenship application fee, with less than $150 million annually from direct congressional appropriations, most of which pays for the E-Verify system employers can use to see whether a job applicant has legal status. In 2016, according to a recent report by the Department of Homeland Security’s inspector general, U.S. Citizenship and Immigration Services’ budget was 6 percent of the department’s overall budget of $64 billion, which includes money collected from fees. The reliance on fees began during the Reagan administration to ensure that taxpayers – which includes green card holders and other noncitizens – would not foot the bill for those who want to become citizens. The system works like this: When there are 50 applicants, the agency collects fees from those 50, which is enough to process the next 50. But when the number of applicants grows exponentially, the agency is paying for its operations with fees collected in the previous year from far fewer applicants, which inevitably contributes to a slowdown. In the past, Congress has called on the immigration agency to make a big dent in its backlog. The Congressional Research Service noted that from fiscal year 2002 to fiscal year 2010, Congress provided about $574 million to help reduce a growing backlog in processing applications. But Congress has rarely stepped in to provide such additional funds. Currently, the immigration debate in Congress is elsewhere, focused on enforcement at the Mexican border and the fate of the Deferred Action for Childhood Arrivals program. The funding bill approved by Congress in March allocated $1.6 billion to boost enforcement on the border with Mexico, including construction of new fencing. Roberto Gil, 48, a well-known youth soccer coach in the San Francisco Bay Area and the 2015 Community MVP for the San Jose Earthquakes of Major League Soccer, is one of thousands recently trapped in limbo by the slowdown. “I was freaking out; it was taking forever,” Gil said. He has been in the U.S. since he was 15 and had one traffic violation a few decades ago, Gil said. He worried that might mar his application. A few months later, a letter arrived with the good news: application approved. He was sworn in as a U.S. citizen in February, a year after he had applied – and plans to register to vote soon. It was a big decision for Gil, who said that after Trump’s election in 2016, he had considered moving to Canada. “It is more welcoming there,” he said. Martha Garcia, 38, recently visited Catholic Charities’ office in Santa Ana, California, with her parents, who are in their mid-70s. All three plan to apply for citizenship. But given the wait times, Garcia knows she is unlikely to reach one of her goals this year: being able to vote. Garcia’s five children were born in the U.S. and thus are citizens. “I want to be part of that with my kids,” she said. She hopes that by becoming a citizen, she will be able to help her partner, who works in construction, eventually become a citizen, too. He pays taxes and into the Social Security system, but like many without documentation, he can’t get a refund or have his Social Security payments credited. Laura Vazquez who works on immigration issues for UnidosUS (formerly the National Council of La Raza), said immigration advocacy organizations have asked repeatedly for U.S. Citizenship and Immigration Services to try to process naturalization applications more quickly, but they haven’t seen much action from the agency. There currently are no requests for extra funding from Congress or other efforts to increase its staff that works on applications. “The number of applications has been increasing for quite some time,” Vazquez said. And more applications are likely, she said, because of the 2020 presidential election. Reveal reporter Aura Bogado contributed to this story. It was edited by Amy Pyle and copy edited by Nadia Wynter and Nikki Frick.